Earlier I had one of those weird fidget moments when I pressed the wrong button on the remote, changed channel, and, hang on - that’s The Infinite Monkey Cage. Radio 4's hit science panel show. On TV! And it’s extended. Specifically it’s Monkey Cage 100! 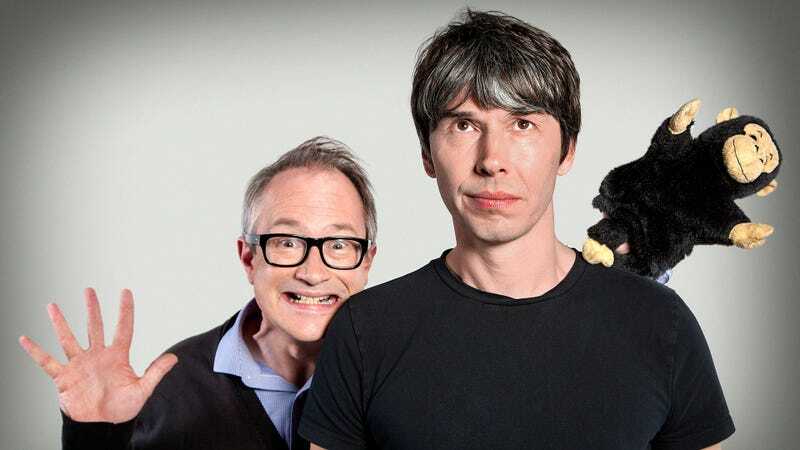 Brian Cox and Robin Ince celebrated the 100th episode of the science/comedy show, by inviting some very well known Monkey Cage alumni to join them. Brian Blessed, Eric Idle, Katy Brand, Dave Gorman and Andy Hamilton contemplated what we know about the universe now that we didn’t know when the show was first broadcast in November 2009. Also taking part were Alice Roberts, American Astrophysicist Neil De Grasse Tyson, Professor Sue Black and Prof Fay Dowker. The show get into the Higgs Boson, interbreeding with Neanderthals, Gravitational Waves and the death of Strawberries. It’s a bit of a giggle and you might learn something. I want to know more about making a Neanderthal brain.